Web Literacy: How Good Are You at Recognizing Fake Web Sites and Email Scams? 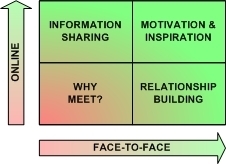 Question for the Day: Why does the face-to-face model of sharing information persist? Currently I'm working with a state-wide group of youth providers working on a specific grant. One member recently circulated an email asking if people were interested in meeting for a few days and if they were, what did they want to accomplish? Within minutes, several emails came back indicating that 1) getting away to a meeting would be difficult and 2) if they were to meet, the main reason to do so would be to share information and answer some specific questions they have about how to operate their programs. Since I've immersed myself in social media tools, I've found that in most situations, I will now ask myself if this is something that could be done more effectively and efficiently on the web. In this case, the first thing I thought was "Why do we need to meet? We should just set up a wiki with the questions and then have people post responses and resources to answer them." Apparently I'm alone in this thought process, though, as meeting organizers are forging ahead. This got me thinking--Why is it that within certain circles, the first response to information-gathering is to have a meeting? Having a meeting makes no sense to me when people are short on time to begin with and when many would be traveling 3-4 hours and would have to stay overnight to participate. Finding an online solution would be more cost-effective, make better use of everyone's time and would also provide a permanent repository for the information that these people will undoubtedly need again at some point. Sometimes I think I'm missing something. Is it possible that because I'm so web-enabled I'm forgetting about the importance of face-to-face meetings and need to quit thinking that the answer can always be found online? (Of course, there's irony in the fact that I searched for answers to this question on the web). As his chart suggests, if people are short on time and they need to gather information, then online is the way to go. If, on the other hand, they are seeking to build relationships and to become motivated and inspired, then face-to-face is the answer. In the case of the group I'm working with, the clear reason for the meeting is to share information. Many members are already working together, so relationships aren't the focus. They may want a little inspiration, but in my experience with this group, the meetings they hold don't necessarily accomplish that objective. They've always done it this way. They haven't moved into that web-enabled mindset of asking if it's something that could be better accomplished with online tools. They have (in my mind, unfounded) faith that when people meet, there is actually a structured transfer of information. On that last point--if meetings were such a great way to be sure that people had the detailed information they needed to do their jobs, why is it that we continually revisit the same questions in every meeting? In the case of the group I'm working with, the questions they want answers to are questions they've wanted answered in every face-to-face gathering we've had in the past year! Obviously face-to-face isn't working too well for them. I suppose that this is all part of the issue of technology stewardship--helping people realize when it makes sense to use technology to get things done. Sometimes I'm frustrated, though, by the persistence of the old ways of thinking. Or maybe it's just that I don't want to have to lose a day in order to get the information I need when there are better ways to do the job. If you liked this post, you may want to sign up to be automatically notified when I post new articles. You can learn more here. Many people are just not comfortable with web tools. They don't have the habit of poking around and testing out web 2.0 apps. Getting them comfortable with the tools (wikis, blogs, etc) takes some hand-holding but once the "ah-ha" moment arrives; off they go. The resistance to web meetings is because they're not a familiar medium. Harold, I agree with you and hear what you're saying. I probably should have included in this post the fact that a few months ago I did a long call with this same group about the possibilities of using web tools to pull together the community. At that time they told me that 1) they couldn't take the time to update and 2) they had their own web systems going on so they saw no reason to connect into a group set of tools and resources. They left me with the distinct impression that they knew about the tools they could use, but didn't want to take the time to use them. Apparently they CAN take the time, however, to drive 4 hours to a full-day meeting that won't give them the information they said they'd need. Although I somewhat give the benefit of the doubt here, at the same time it IS frustrating. But it got me to wondering how it is with all the comms technologies we have, we're traveling for work more than ever before. I think there's something more going on here that goes beyond relationship building and motivation, or lack of comfort/knowledge of web 2.0 tools, and that's about trust. It's about looking people in the eye, seeing their body language and being able to react appropriately to all those nonverbal cues. It's the ability to react instantly when a question or concern is raised, rather than waiting for cumbersome written messages to make their way back and forth across the ether. As humans, we're built with a lot of communication tools that we often aren't aware we're using. I too would like to find a way to reduce the amount of travel needed for meetings. Better for the environment, budget, and wear-and-tear on staff. Maybe when video conferences are as common as phone conferences, we can get there. Or maybe we just have to wait until the next wired generation is in charge. Bronwyn, I think you're right about face-to-face meetings as a way to develop trust. Although I will say that I've also been able to develop trust with people I've never met--bloggers. The trust formation process there may be slower--I'm not basing it on those micro-cues of facial expression, tone of voice, etc. But I also wonder if the trust that I develop isn't, in a way, more accurate. I trust particular bloggers because, over time, I can read what they write as a trail to their way of viewing the world. I can return to it again and again to see if I may have inaccurately remembered a "conversation." I can also see if people deliver on what they promise over a period of time. Anyway--I'm hoping that we don't have to wait 15 more years for people to drop this over-reliance on face-to-face. . . Very interesting post, Michele, and lots of food for thought. But I'm going to be a contrarian, to some degree. On one hand, I think gathering people from geographically distant places together for a meeting without clear goals, or with a simple goal of information sharing, is probably not such a good idea. But, in my humble opinion, *nothing* can substitute for face-to-face interactions. Although I agree that I have definitely been able to developed trust in colleagues that I've never met in person, there is also no question that my closest collegial relationships are with people I have met in person at least once. There are a lot of intangibles about groups of people actually being in the same room with each other - intangibles that I'd be loathe to give up. Of course, it also depends on organizational mission. An organization that is high-touch needs f2f meetings. One that's not so high-touch, might not. No, I don't want to fly too much, or drive too much, but I also don't want to sit in front of this damn 14" screen too much either! I think that it's important to find the balance, and understand that people who might seem simply wedded to old ideas might actually have a point. It's not really about efficiency of information transfer, it's about information transfer of the kind that can only happen when people are physically in the same room together. I have worked online for nearly thirty years (anyone recall Telnet?). Preferring to meet in person is not related to the technologies that are available (or the lack thereof). It is a function of an extroverted personality and apparently it has a biochemical basis. I agree that things are much quicker when completed online, just as a cel message is faster than a cel call. Speed is not the priority for many people. There have been many studies in this area over the years. Basically, only about 30% of us are satisfied with quickly interacting for the exchange of data. That leaves a whopping 70% who want to meet in person, and who will NEVER prefer to do otherwise. In short, these people draw their enthusiasm and personal energy from direct contact with other people. Video does not satisfy that need. Podcasting does not satisfy that need. It involves more than sight and sound. Now if Web 2.0 tools could pump human pheromones across a "meeting enhancement" wiki, then you might have a hope of prying those people out of the face to face meeting mode. Apparently, the scent of others who reach agreement is part of the face to face crowd's need. If you have the time, delve into some light reading in the recent research (2006). If you can find a way to trigger the calming effect while using online products, you may be able to corral the 70% majority who want face to face contact. Anyone up for developing a pheromone releasing keyboard? This has been a very challenging question for our organization as well. As a nonprofit with globally dispersed staff, face-to-face meetings are expensive, often unfunded by donors, difficult to coordinate. But yet there seems to be no progress without them -- it is almost as if people don't become "real" until you meet them in person. I think this resistance is more pronounced in cultures where technology is not so prevalent. I don't have any suggestions or solutions, only frustrations. But I am open to all suggestions for how we can make virtual teaming work when the reality is that there is no substitute for face to face, but costs and other concerns often prevent it. There are those who bond and communicate more successfully in a face-to-face environment. That visual contact provides clues as to how a message is being received. That nuance is missing in social networking tools and yet is frequently key to diplomatic exchanges. Bear in mind that human beings require a certain level of physicality in their bonding. I don't know that "over-reliance" is necessarily a fair assessment of the situation. Jill--I absolutely agree that there's a need for face-to-face meetings and don't mean to advocate getting rid of them altogether. In the case of the group I'm working with, though, there is an over-reliance on meetings in the sense that there's little to no information sharing that goes on in anything other than a face-to-face setting. The group does exchange emails on occasion, but that's about it. My issue is that if the goal is to share information, there are many tools that could be utilized that they aren't using. Even if they summarized the results of meetings and shared that information online, that would be a step forward for the group.